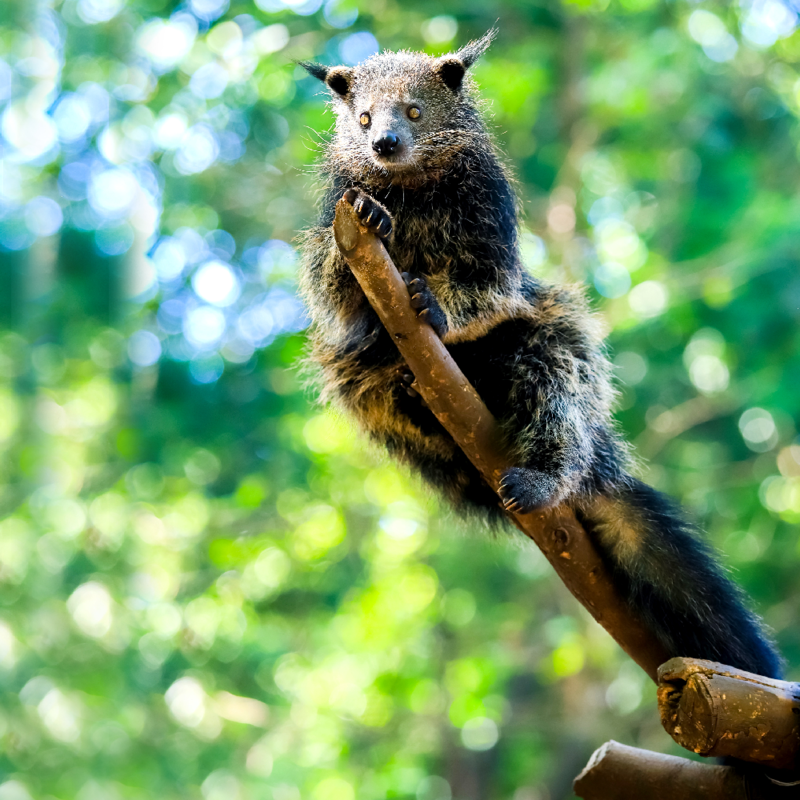 Meet the Binturong (Arctictis binturong), also known as the bearcat. While the mammal resembles a bear and a cat, it is not closely related to either animal. Instead, it is closest to the Palm Civet. 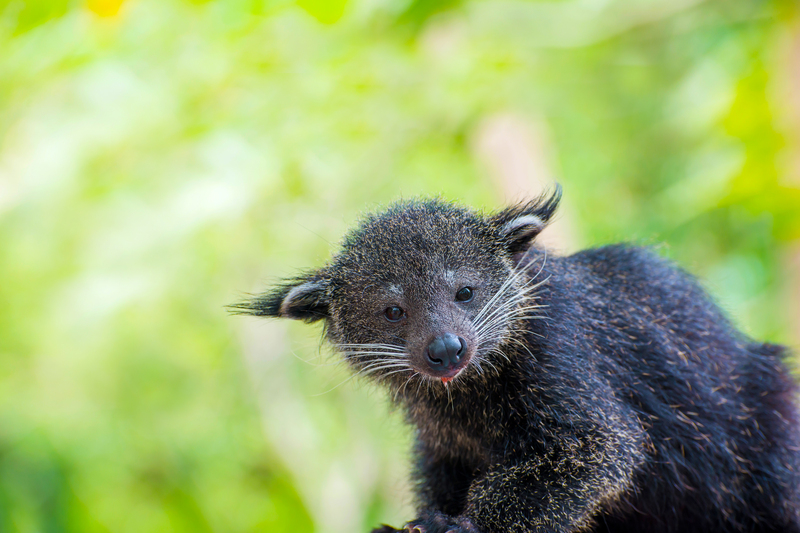 The bearcat is native to Sumatra, Kalimantan and Java in Indonesia, where it is similarly known as Binturung. It is also found in South Asia (Bangladesh, Bhutan, India, Nepal, and Yunnan in China) and Southeast Asia (Cambodia, Laos, Malaysia, Thailand, the Philippines and Vietnam). It is one out of the 71 mammal species which have been identified in the Restorasi Ekosistem Riau (RER) area within the Kampar Peninsula. Binturong also known as the bearcat but not closely related to either bear nor cat. The Binturong holds a Vulnerable (VU) conservation status issued by the International Union for Conservation of Nature (IUCN). It is one of the only 10 globally-threatened mammals with a vulnerable status which have been identified in RER. The Binturong has thick, strong black fur, and large, black and prominent eyes. Its ears are short, rounded and edged with white, while long black ear tuffs protrude from them. A distinct feature of the bearcat is that it possesses scent glands which emit a smell akin to popcorn or corn chips. Although the Binturong is a strongly arboreal (tree living) species, it is a heavy animal, making it unable to jump from tree to tree. But the bearcat has a prehensile tail – meaning that it is capable of grasping – which acts like an extra hand. This proves especially handy when it comes to climbing trees. This tail is also very long (66 to 69cm), nearly as long as the animal’s head and body (71 to 84cm). 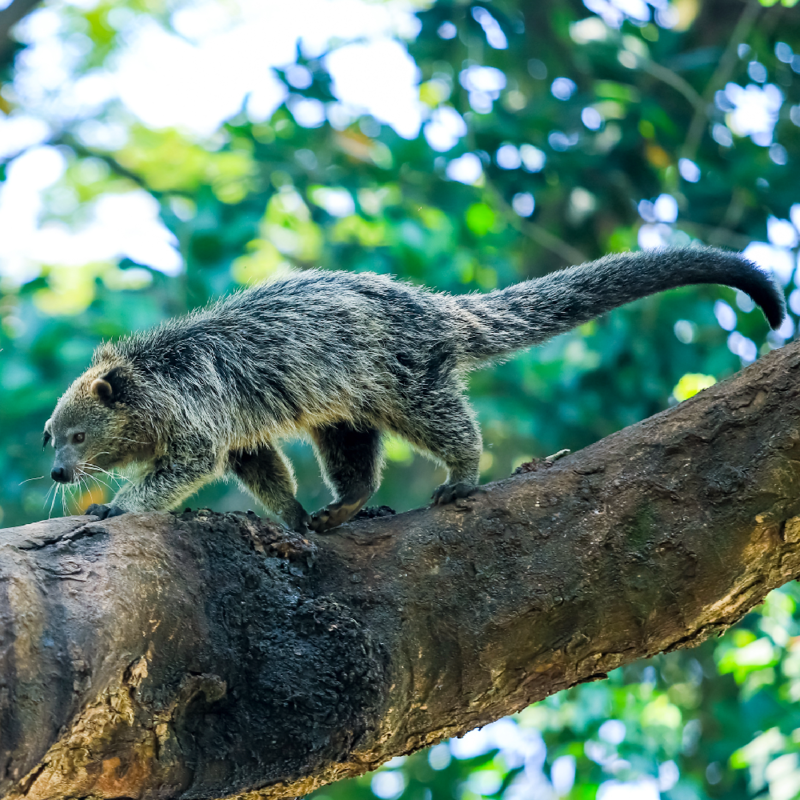 Binturong is a strongly arboreal (tree living) species. The Binturong is considered a noisy animal, emitting snorts and chuckles when happy, and growling fiercely when annoyed. It grunts or hisses when prowling, and a female Binturong will purr if she is attracted to a male. When threatened, the bearcat will escape into a nearby tree. However, it may also urinate or defecate on a threat. If this fails to drive the enemy away, the Binturong will bare its teeth and snarl, or use its powerful jaws and teeth for self-defence. Despite living in the same area as predatory species like leopards, clouded leopards and reticulated pythons, the Binturong is hardly preyed upon by them. The Binturong is considered a noisy animal, emitting snorts and chuckles when happy, and growling fiercely when annoyed. This bearcat is an important agent for seed dispersal, particularly for the strangler fig – a common tropical plant found in many forests around the world. It is one of the only two known animals with the ability to digest and soften the tough outer covering of the strangler fig’s seeds. Due to this, the Binturong is a vital species in the rainforest ecosystem. 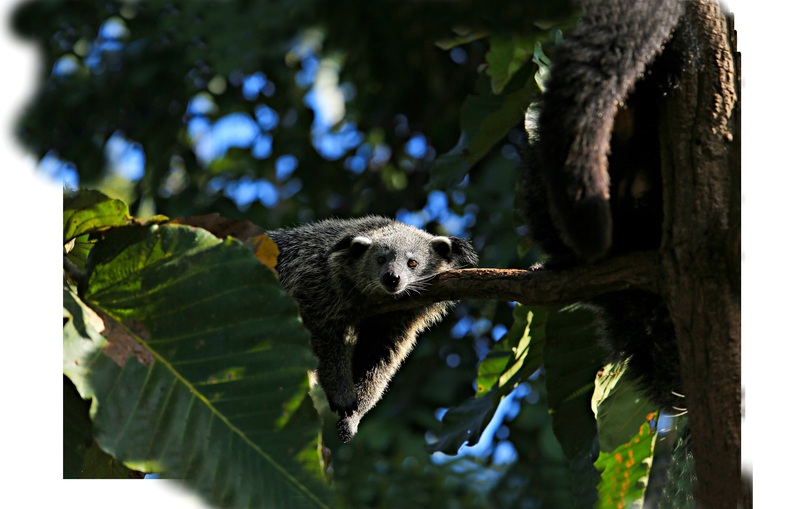 The Binturong population is estimated to have decreased by more than 30 per cent over the last three decades, with the key threats being habitat loss and degradation of forests through logging and conversion of forests to non-forest land use. Currently, the Binturong is a protected species in Indonesia and Malaysia. It is also listed as an endangered species on the China Red List.